After five and a half years as Foreign minister, yesterday, Ditmir Bushati handed over his post to Prime Minister Rama. However, this followed Rama’s factual resignation. The Prime Minister declared that he had decided to resign from the post of Foreign minister and announced that he delegated his powers to deputy minister Gent Cakaj. This was also confirmed by the Ministry for Europe and Foreign Affairs in a statement issued last night: “Prime Minister and minister for Europe and Foreign Affairs, Edi Rama officially delegated all of his powers as Foreign minister to deputy minister Gent Cakaj. 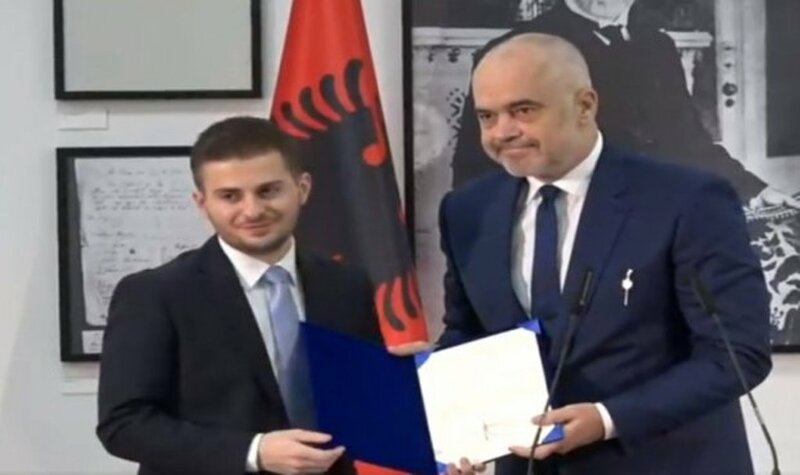 Rama said that Cakaj will be the head of the Albanian diplomacy”. Meanwhile, this is how Rama announced his resignation from the post of Foreign minister: “I, Edi Rama, Prime Minister of Albania and Minister of Foreign Affairs delegate this post to vice minister of Foreign Affairs, Gent Cakaj”. After this factual resignation, vice minister Gent Cakaj considered this to be a good start. “I’d like to thank PM Rama for the trust he has put on me in every step of the way”, Mr. Cakaj said. Meanwhile, Cakaj said that there will be no changes in strategic objectives of the Albanian government in terms of its foreign policy. “With fresh energies and a proactive approach, we will continue to push forward the process of regional integration, by strengthening Albania’s profile as an active and dynamic actor”, Cakaj said. Meanwhile, during the ceremony with the diplomatic staff, minister Bushati, who spent his last day in office yesterday, talked about his achievements as head of this ministry. “Although I will no longer be part of the daily work of this institution, I feel happy that I shall be part of the history of this institution”, Bushati said. “Since day one, I have relied on three things: integrity, faith and respect. The ministry that I’m leaving behind is much more solid and much more capable of addressing current challenges than what it was five and a half years ago”, Bushati said. Meanwhile, the minister who in the past 12 months focused his agenda on the agreement with Greece, did not mention this aspect in his speech. In his speech delivered during the ceremony, Gent Cakaj spoke for the first time about the big clash that he provoked in Albania and Kosovo. “After everything that was said about me, now I feel better because being the head of this key institution of the Albanian state is a big start following the unfounded accusations that were launched against me”. Addressing to Meta in distance, after the president refused the nomination of this minister due to his public statements regarding the borders of Kosovo and the Balkans, Cakaj said that “this transfer of institutional authority from Bushati to me through PM Rama, does not imply any changes in strategic objectives of the Albanian government in terms of foreign policy”. A few hours after Rama handed over all of his powers as Foreign minister, the President of Republic avoided another clash with the Prime Minister, by considering this as an internal issue of the government. “The president does not interfere and does not comment on internal matters concerning the government and ministries. As president, I respect the Constitution and I’m very clear about my powers and the institution that I can delegate to enter international treaties on behalf of the Republic of Albania”, Mr. Meta declared yesterday. On 14 January, the President provided his arguments about the decision to reject the nomination of Gent Cakaj as Foreign minister. Meta made it clear that Cakaj cannot and would not become a Foreign minister. But Rama defied the President and the fact that Meta did not react yesterday may be seen as an attempt for truce in the “war” between the president and the government.